I am over the moon to be joined by author Karen King today to talk all things bookish following her Chill With A Book Award win. Hi Emma, thank you so much for inviting me over to your blog. My name is Karen King and I write sassy, feel-good romance and edgy young adult novels with a heart. I was born in Birmingham, UK, and have lived in Cornwall and Worcester before moving to Spain in November. It’s very hot here at the moment! 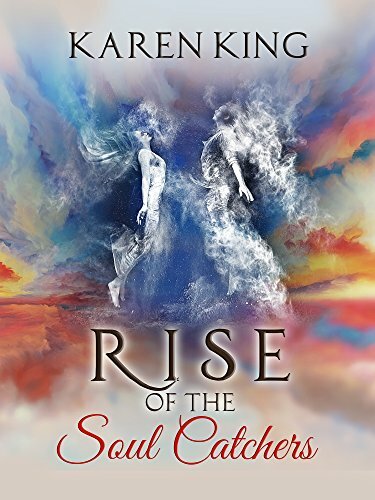 Rise of the Soul Catchers is set in the afterlife and is based on the concept of true love being eternal, and of the soul carrying on after death. The two main characters, Sapphire and Will, are killed in the first chapter and separated in the afterlife so try to find each other. They discover that the afterworld is split into seven zones, each named after a colour of the rainbow. They both believe the other one to have been taken by the Soul Catchers to Red, a zone where all your nightmares come true. They love each other so much that they go to Red to find each other. The story is written from both of their viewpoint and is a mix of romance, adventure and horror – the first time I’ve ever written horror, actually. It’s a story that’s close to my heart as I believe that we carry on after we die and will see our loved ones again. It was first published as Sapphire Blue but has now been republished and rebranded, by Littwitz Press. It’s wonderful to know that someone enjoyed reading my book enough to give it an Award. That means a lot to me. I started off writing children’s magazines and books for a variety of publishers – I’ve had over 120 children’s books published. Then I moved to writing Young Adult and romances. I’ve five romances published by Accent Press, the last one was published on 7 June this year and is titled The Bridesmaid’s Dilemma. Accent Press have also published my first YA, Perfect Summer, a dystopian story set about thirty years in the future, where Society has become so obsessed with perfection anyone who is different in any way is looked down upon. I’m delighted to say that I have recently signed a two-book contract with Bookouture and am busy writing the first book, Snowy Nights at the Lonely Hearts Hotel, which will be out in November, followed by the second book in February. I’m also writing my third YA novel. Reading, spending time with my family and friends, watching the soaps whilst eating a big bar of chocolate. Richmal Crompton, I used to laugh out loud whilst reading her Just William books when I was a child, Enid Blyton for her amazing imagination and storytelling, and Sophie Kinsella for weaving such relatable stories around every day characters. I write in a variety of genres. I like variety in what I read and write. Which other genre would you choose if you had to change? I’m happy to have a go at writing anything except horror. Tea or coffee? Tea first thing in the morning then coffee throughout the day. Marmite – yes or no? No. Marvel or DC? Marvel – I wrote for many Marvel children’s comics back in the eighties. Early riser or sleep in? It depends what I have to do that day. Planner or pantster? A bit of both. Book or kindle? Both, depending on the occasion. Pineapple on pizza – yes or no? Yes. That’s a tough one as there are so many books I love but I think it must be Gone with the Wind. What a masterpiece of characterisation, family dramas and pacing. It kept me hooked right until the end. You’re welcome, Emma. Thank you so much for inviting me over. And you can find out more about the Chill With A Book Awards here. Karen King is a multi-published author of children’s books and romantic fiction. She has had 120 children’s books published, two young adult novels, five romantic novels and several short stories for women’s magazines.